Seeing the rapid growth of Union County in the early-20th century and the impending threat of development on the available open space and the Rahway River, the key potable water source, the citizens fought for the creation of the Union County Parks Commission. Upon creation of the Commission in 1921, the Olmsted Brothers firm was engaged to create a county-wide park system. The essence of the design proposed by the Olmsted Brothers firm was to create a comprehensive design for urban and suburban parks, a reservation in the mountains (Watchung Reservation), and a series of parkways along the Elizabeth and Rahway Rivers, all of which would provide ample space for recreation opportunities. The proposed parkways were to become the distinguishing feature of the system by serving as the linkages between the various neighborhood parks essentially creating a continuous linear park system. The neighborhood parks, of which Rahway River Park is one, represented a change in the vision for suburban and urban areas as previously established by the City Beautiful Movement, which advocated placing a high priority on the integration of city planning (architecture) with the provisions of open space and parkland meant for the enjoyment and psychological health benefits provided to its inhabitants. The Union County park system represented a developmental change in the environmental, social and urban history supporting the protection of natural resources and enhancing the quality of life in urban areas. Rahway River Park was designed under the guidance of Percival Gallagher, a partner in the Olmstead Brothers firm, during the period from 1921 to 1929. When the Union County Park Commission engaged the Olmsted Brothers to design the park system, it looked to its neighbor, Essex County, which, in 1895, had created the first county park system in the country under the direction of the Olmsted Brothers. The Olmsted Brothers firm was established in 1898 by Frederick Law Olmsted, Jr. and his half-brother, John Charles Olmsted, after their father Frederick Law Olmsted, Sr. retired. Utilizing their own talents, by the early years of the twentieth century the firm had become one of the largest landscape architectural firm in the country. Rahway River Park, today, is one of the most active parks in the county park system housing a variety of amenities that are open for enjoyment to all who visit. 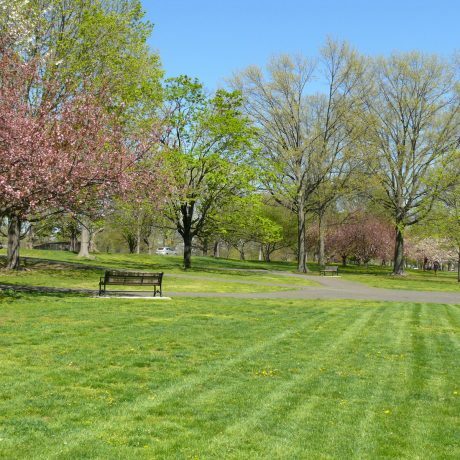 The key features of the park are its proximity to the Rahway River, which serves as a backdrop and a natural buffer to the neighboring houses, and the large open field at its center that offers uninterrupted site lines in all directions. This center field is then dotted with informal ball fields including the track and field under consideration for expansion. Surrounding this center open area is a perimeter walk shaded with a semi-dense tree line, and adjacent to this walk is a perimeter drive that has an even denser tree line at its outer perimeter essentially isolating the park from its neighbors. The beauty of the park is not only its natural elements but also the overlapping of nature with the passive recreational activities within the park. One can find both quiet places to sit and contemplate and places to be in the center of activities. The County of Union, in concert with the Rahway Board of Education, is currently undertaking renovations at Rahway River Park to expand an existing field and track for the near exclusivity of the Rahway school system’s athletic program. The expansion will include not only improvement and expansion of the field and track but the addition of several buildings, which will interrupt the sightlines and viewsheds created as part of the original Olmsted Brothers design. Despite strong opposition from many citizens, the Union County Freeholders broke ground on the project in December 2015. The planned expansion of the track and field at Rahway River Park is wrong on two significant fronts, and each is in direct opposition to the park’s origins as well as its historical significance and development. The first issue is the lack of understanding of the significance of the open sightlines created as part of the original design. The proposed expansion of the field and track includes not only adding lights, bleachers, and fencing not currently present, but also a field house, restrooms, locker rooms, and concessions stand that impose on the currently open space created as part of the original design. The second issue is that the expansion of the track and field, which includes the use of artificial turf considered an environmental hazard, is specifically to benefit the Rahway Board of Education by providing a venue for its competitive, school-related sporting activities. The Olmsted Brothers understood the difference between parks developed for passive recreation incorporating neighborhood ballfields and those that house organized sporting events. It was not the intent of the design for Rahway River Park to include fields for the exclusivity or near exclusivity of one segment of the Union County citizenry or for organized sporting events. By creating a track, field, and support facilities for the Rahway Board of Education, the County is not adhering to its own assertions that its parks are for the benefit of all. The activity, both of the teams and spectators, will have an adverse effect on the other activities within the park making the park virtually unusable on days where school sporting activities occur. The public officials have ignored the historical significance of not only Rahway River Park but the entire Union County Park System in their recent decision making, and in the future, they need to view the park within the context of its significance and historical development. While the Rahway River Park project is inevitable at this point, efforts should be made to prevent additional renovations at this Park and similar projects from occurring at other Union County parks. Listing Rahway River Park or the Union County Park System as a whole on the New Jersey and/or National Registers of Historic Places would add a layer of oversight and review for any future publicly-funded park projects.